We climb a steep hill–we don’t know its name, only that the street narrows into a series of stairs and tiny plazas, and stairs and tiny plazas–ascending to its peak. 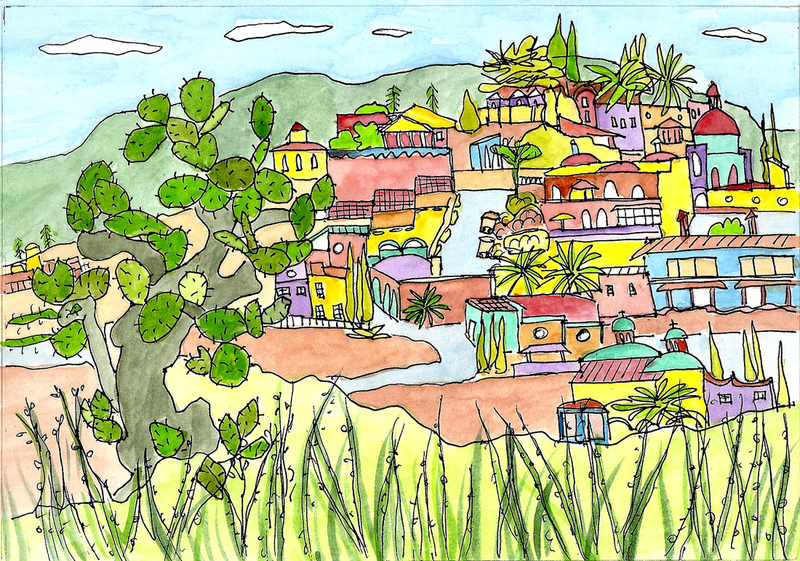 At 6,500 feet, San Miguel de Allende dazzles in the midday sun, but we don’t linger long. Instead, we follow a path through scrub brush and wildflowers, past nopal and garambullo cacti, tall as trees, and settle down on rocky seats to sketch the landscape. It’s been rainy all week, but today the clouds disperse and the sun presses hot and welcome on my back. In the distance, the sounds of hammers, a power saw, and the faint echo of music reverberate down the hill where houses are stacked like colorful Legos. Someone whistles a tune. Happy. In the courtyard of the Temple of the Immaculate Conception, blue and white plastic ribbons and flags flap in the light breeze on a temperate, late January afternoon, creating a soothing haven from the rumble of traffic sput-sputtering outside the walls. On the corner, just beyond the gate, an ice cream vendor slouches beneath his umbrella, waiting for kids to arrive after school. His sticky concoctions pull at my imagination: limon, cajeta, café, chocolate, vanilla, queso. coco. Uno café, por favor. The morning dawns bright and clear. We christen this “Laundry Day,” and ascend the metal stairs to the washing machine on our rooftop aerie, our basket full to brimming. 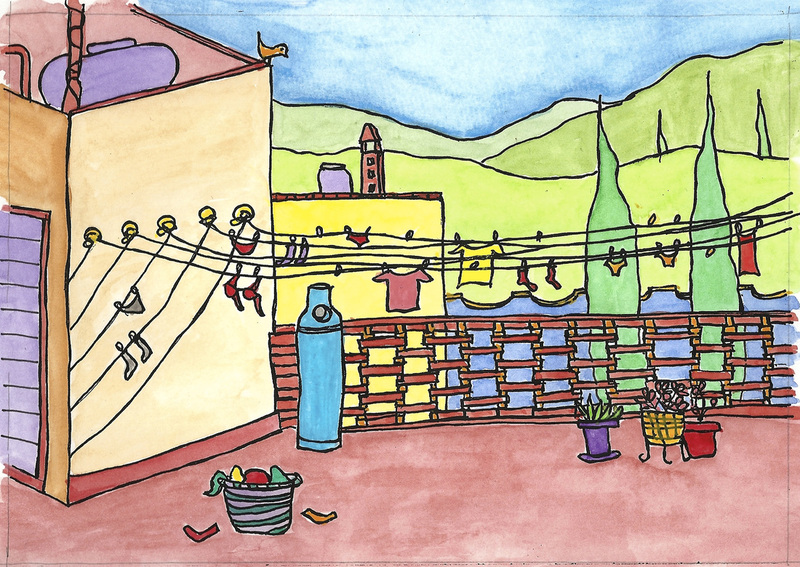 Hanging clothes on the line turns the day into a party: socks dangle, undies sway, and tee shirts wave in the light warm breeze. We descend to the kitchen, returning with tea and sandwiches for an impromptu picnic, gazing across rooftops to the distant rocky hills reminiscent of Tuscany. In the street below, a jangling song announces the truck hawking propane tanks, while-from the garden-sweet trills of vermillion flycatchers lulls us into reverie, and thoughts of an afternoon nap.